Orestes Orlando Orr, who was born in Illinois, arrived in the county in 1878 to teach school on the Avenue. His real interest however was to become a lawyer. He was admitted to the bar in 1881 and became a member of the first law firm in Ventura County. He was elected District Attorney in 1884 at age 27, and he held the office for three terms. He married Ella Mae Comstock in 1881. She had been born in Oskaloosa, Iowa. 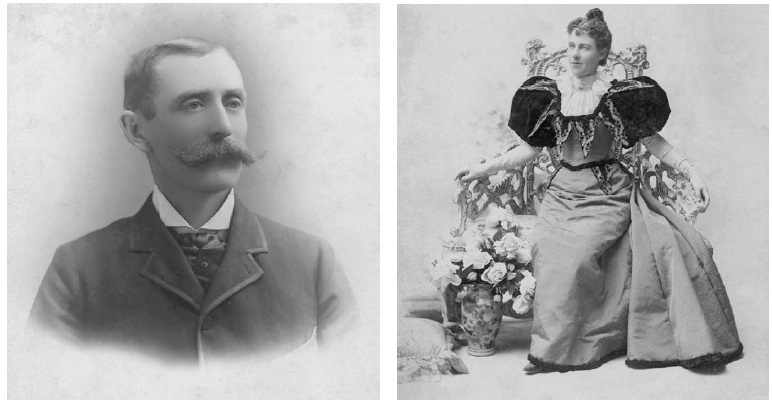 The lives of the couple entered a new phase when Orestes ran for the office of State Senator in 1892. The Ojai reported on November 5 of that year that “The Republican meeting at the school house last Saturday night was a rousing one. Orestes Orr made many votes for himself by his manly talk . . . .” He was elected. While serving in the State Senate, he held the chairmanship of the Roads & Highways Committee, a prominent position considering the great drive for good roads at the time. A couple of years later, he chaired the Senate Committee on Corporations. The photographs above may have been wedding photographs, but a note on the back of Ella’s states that her dress was typical of what she would have worn to official functions in Sacramento. Unfortunately, Ella Mae died young, at age 41 in 1908. Orestes continued to practice law in Ventura County. His son Harold held the position of Ventura City Attorney for 35 years. Harold received Earle Stanley Gardner into his Ventura law firm in 1915. Orestes’ son Charles owned the Hermitage Ranch in the East Valley, and Orestes himself lived on Signal Street at the time of his death in June of 1915.